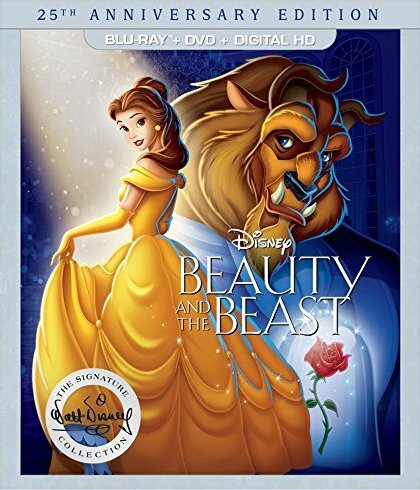 Beauty and the Beast is a good movie, one of the few Disney animated films that I really like. It has catchy songs, some really nice visuals, some great voice acting, interesting characters, and a straight forward story that was easy to understand and follow. The art style was a mix of traditional 2-D animation and computer graphics, which is most notable during the ballroom dance scene. The film looked great, both of the main characters had a vulnerability that let you care for them, and the supporting characters were great comic relief. The movie isn't flawless, though. The motivation for the prince being turned into a beast, along with his entire castle staff, was pretty weak. So a guy doesn't let a stranger into his house at night... which most people probably wouldn't... and now everybody who works for him is cursed until he can find someone to love him? That's pretty messed up! The prince may have been a jerk but that old witch is evil! I really liked Belle as she seemed different than most Disney princesses. She wasn't rich or naive, she wasn't tired of being royalty and she didn't dream of becoming royalty, she just wanted to read books and learn about the world. But then when she meets the beast and they eventually fall in love, although it was sweet it also kind of felt like Stockholm syndrome. We really know nothing else about the beast/prince... do they have anything in common? Maybe those are just nitpicks, but it's what I notice when I watch it. Ah, so you noticed the three different versions of the film, did you? The extended edition has an additional scene, and I couldn't tell what else until I went online to find out what else had changed. It seems it was mostly minor stuff like different backgrounds in various scenes. The sing-along version puts words on-screen to help you sing along to the songs... not something I would use but I'm sure if you have kids they'd like it. There's a lot here so I'd stay definitely worth getting if you don't already have it on DVD.